My friend Kenneth Hobbs died today. He suffered a massive heart attack two weeks ago and never made it back to us. You’ve heard me talk about his work. 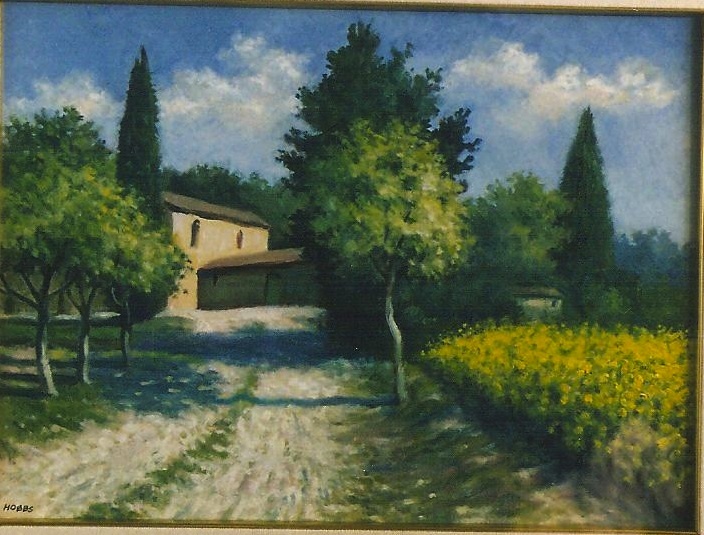 One of his paintings is even on this site. But I haven’t talked much about who Ken was outside of his paintings. He and his wife, Janet have become my Montepulciano family. Sunday lunches with them, glasses of red wine and long conversations form some of my favorite memories of my time here. Ken and Janet moved here over 25 years ago, expat newlyweds on an adventure that never stopped. They shared a love of travel and art and music. Just three weeks ago I was toasting him bon voyage on his trip to France to visit the house of Cézanne in Aix-en-Provence. 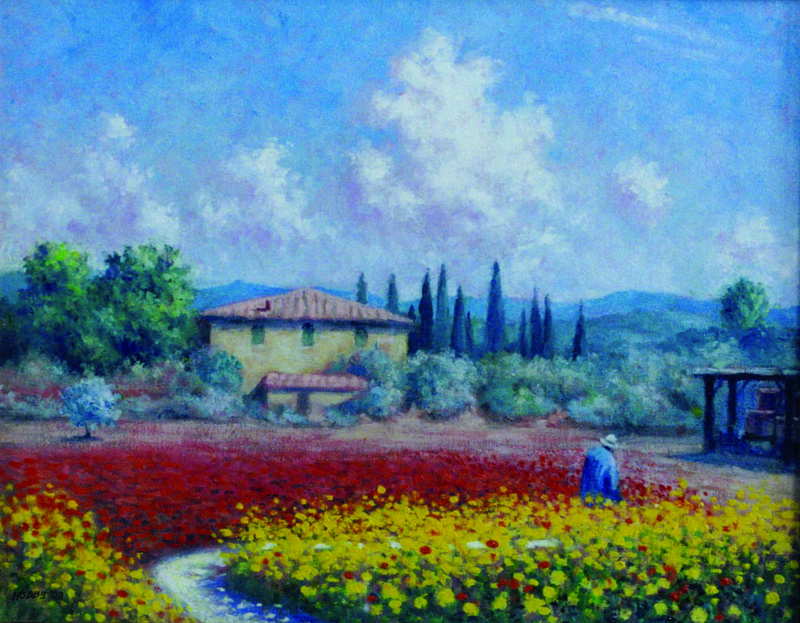 Monet and Cézanne were two of his favorite painters and inspirations for Ken’s beautiful paintings. At 86 Ken still painted daily, producing a legacy of work that covers most of walls of Janet and Ken’s home and also those of one of our local restaurants. Ken whistled while he painted in his attic studio and when I would sit outside in the afternoons with Cinder, it always filled me with a sense of peace to hear his melodic whistle echoing down the street. From a naval officer in World War II, to a creative director on Madison Avenue (one of the original Mad Men, he liked to say), Ken was a story teller. He told them in words, in photos, in fiction and in his paintings. He was a collector of toy soldiers, a lover of classical music and a great reader. 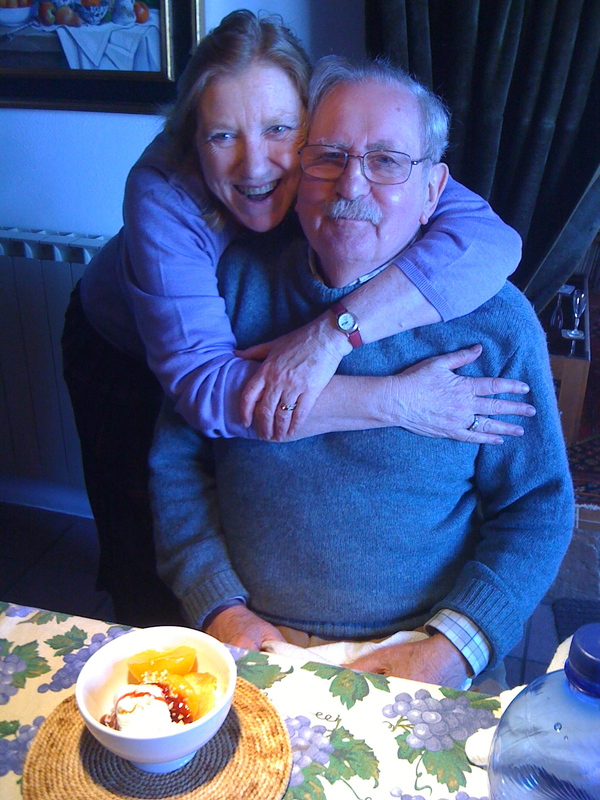 He made a delicious ragù and although he never spoke much Italian in public, usually relying on Janet’s language skills, he loved Italy and he loved Montepulciano. British by birth, he still had his cup of tea every afternoon, but in the mornings he took a cappuccino and brioche at the local bar. He was a the epitome of a gentleman, but also had a wicked and bawdy sense of humor. In addition to sharing a bond as Leos and a love of carrot cake, we also shared a passion for the local dessert wine, Vin Santo. We made it our mission at Sunday lunches to try most of the Vin Santo produced here and considered ourselves relative experts on the subject. I never tired of listening to his stories, especially those about meeting Janet who he often proclaimed was the love of his life. There will be a small memorial for Ken on Tuesday, but the real memorial will be in the summer. 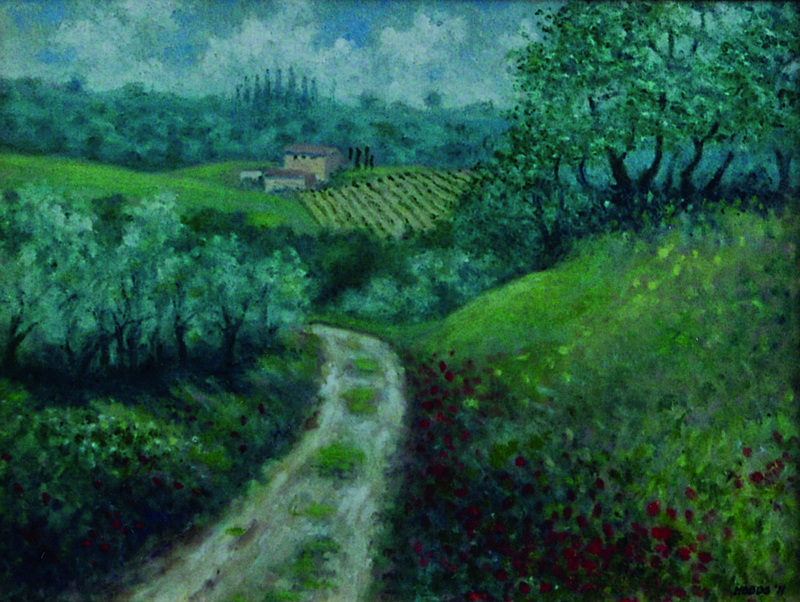 In August, when Leos thrive, we will celebrate Ken’s life with a walk in the nearby Tuscan countryside that so inspired his work. We will sprinkle his ashes, drink some wine, eat some carrot cake, and remember. Addio, amico mio. 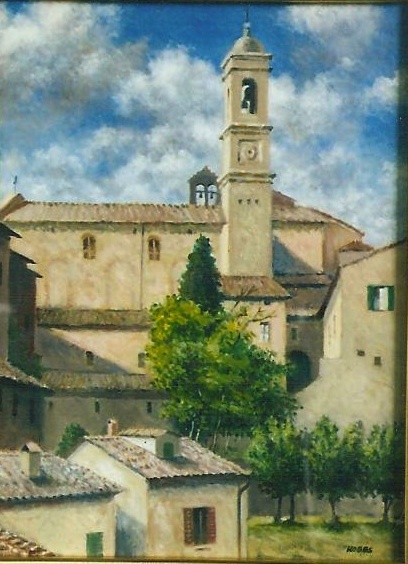 I look forward to seein Ken’s beautiful artwork when I visit Montepulciano in the spring. So sorry for your loss. Sounds like he has left you with many great memories. This is a lovely tribute to your dear friend and am very sorry for this great loss. What a beautiful tribute to your friend Ken. I’m so sorry you’ve lost him, but how much richer your life has been from knowing him…..it shines through your words. Take care…. What a lovely memorial to your dear friend. It sounds like he lived a full and remarkable life. Thank you all for the lovely words. I am glad that I was able to share a little bit of Ken with all of you. As always your writing has invoked a feeling of knowing! Sorry for your loss! Thank you for sharing a little bit of Ken’s life with us. Everyone of us has a story and I’m glad that Ken and Janet has touched your life. I love that you will be celebrating his life in August with a few of his favorite things. His work will live on in his paintings. Such a poignant post. Love your writing and am so looking forward to reading your book! Beautifully written, this post brought tears to my eyes. I didn’t know Ken at all except for a couple references in your book. Through your tribute I feel like I know him a bit better. The summer walk will be a fitting memorial to his life, which seems to have been very well lived.